Immediately after his release in September he left the country for medical treatment, then got some love in Switzerland before returning to Iraq. Now he has established a foundation . Maybe some day he’ll be remembered for something other than the shoe-throwing incident. The MAZ Foundation being secular and independent of all political and religious institutions intends to bring financial, medical and logistical aid to the victims of the breaches to Human Rights in Iraq. It is also the ambition of the foundation to play a role in the prevention of the violating of Human Rights by giving media coverage to individual and collective tragedies and to making international opinion aware of the suffering of the Iraqi people. The MAZ Foundation also intends to finance all national and international legal actions leading to the acknowledgement of guilt and responsibility for the physical, material and moral prejudice suffered by the civilian population. Here’s the contact page if you should wish to donate. AP News has a news article about my favorite show thrower that reads like a blog post. The author/reporter couldn’t resist injecting his own point of view into his article, and for some reason the editor let it run. He [Muntazar al-Zaidi] condemned the United States, saying it played a role in 1 million deaths and forcing 5 million people to flee. He made no mention of the violence among Iraqi groups since the 2003 U.S. invasion. Did the author/reporter, Bradley S. Klapper, used to write speeches for George W. Bush? Because this sounds exactly like something he’d say. As if, when talking about the US invasion of and years-long @#$%ing of Iraq, it’s unfair not to mention that some of the deaths were at the hands of Iraqis fighting each other as a result of the world-class incompetence of the Bush administration. I think this is an outgrowth of the “fair and balanced” trend in journalism today where if you have a scientist on your show explaining global warming, you must give equal time to whacked out minister or small town board of education member countering that God wouldn’t make the earth any warmer than we can handle. Most of Iraq’s 2 million international refugees live in neighboring Syria and Jordan, while the International Organization for Migration says a similar number of Iraqis are uprooted inside the country’s borders. About 100,000 Iraqis have suffered violent deaths over the last 6 1/2 years, according to The Iraq Body Count, a London-based group whose figures are widely considered a credible minimum. Al-Zeidi’s reception in Switzerland was noteworthy. While his shoe-throwing act of protest in December made him a hero for many in the Muslim world, there was little public outpouring of support for him when he was released last month in Baghdad. To back up his claim that al-Zaidi got a lukewarm reception in Iraq, Klapper gives us no facts whatsover. We’re supposed to take his word for it because he’s a news-talking guy. I mean, I can understand that Mr. Klapper wants to make the pinko Swiss look un-American, but what’s his angle, trying to make it sound like Iraqis weren’t happy to see al-Zaidi out of jail? The Iraqi journalist who hurled his shoes at President George W. Bush leaned back in his chair and soaked in the round of applause. This was not Baghdad or Damascus or Beirut. This was Geneva, where Muntadhar al-Zeidi was given a hero’s welcome Monday far warmer than the subdued reception in his own homeland. Again with downplaying the way the Iraqi’s received him. That is so bizarre. By the way, Muntazar al-Zaydi now has 46,248 fans on his Arabic-language Facebook page. 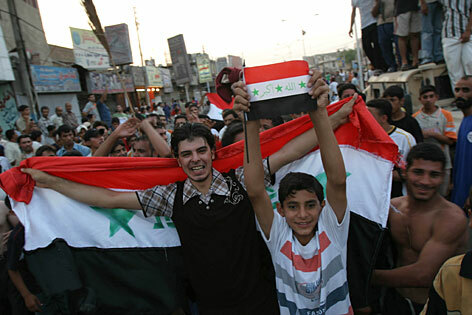 Here’s a Guardian audio article about the celebrations in Baghdad on the occasion of al-Zaydi’s release. They do report that it was more subdued than they expected. That could be because it was in the middle of Ramadan. Possibly because al-Zaydi wanted some peace and quiet. Mr Zaidi returned to his home in the Shia suburb of Sadr City, where relatives had gathered with balloons, banners and sheep to slaughter in his honour. Another brother, Uday, said the journalist would be sleeping at an “undisclosed location” and would travel to Greece for treatment on Thursday. And OMG, I went one click too far, and found this execrable post by Bob Barr saying al-Zaydi should quit whining, because if he had thrown his shoes at President Bush while being a swarthy Iraqi in the United States, he would have been treated much worse, probably including waterboarding (which he says he was treated to in Iraqi prison, too). As if everyone didn’t know that already. I don’t usually link to assholes, but the commenters are pretty funny. Apparently Bob can’t attract his own kind to his blog. UPDATE: My apologies to Bob Barr. A little bird suggested that my sarcasm meter must have gone out of whack, as Barr’s whole post was a work of sarcasm. I am disappointed in myself, since sarcasm was the only language my family spoke at home. Also, if parts of this post appear to missing, blame WordPress. I don’t know what’s going on with that. Muntazar al-Zaydi will be released. Muntadhar al-Zeidi’s act during Bush’s last visit to Iraq as president turned the 30-year-old reporter into a folk hero across the Arab world amid anger over the 2003 invasion. He has been in custody since the Dec. 14 outburst, which occurred as Bush was holding a joint news conference with Prime Minister Nouri al-Maliki. He was initially sentenced to three years after pleading not guilty to assaulting a foreign leader, then the court reduced it to one year because the journalist had no prior criminal history. Defense attorney Karim al-Shujairi said al-Zeidi will now be released on Sept. 14, three months early. Zaidi’s relatives accused the Iraqi government of hypocrisy. They asked why American security contractors and Iraqi politicians had yet to be tried for alleged crimes while Zaidi faced charges. “Nobody summoned [guards with the U.S. security firm] Blackwater for what they did to Iraqis. [Parliament member] Mohammed Daini, who is suspected of killing dozens of Iraqis, is in Baghdad now. Why are they not able to detain him? Why do they do this with Muntather Zaidi,” demanded his uncle, Haidar abu Karra. What I like about this story is that it is clear that Iraqis have a national identity, contrary to what many politicians and most of the media have been trying to tell us since we went in and busted up the place. Reporting from Baghdad — “Long live Iraq,” Muntather Zaidi declared in court today, according to his lawyers, after a judge sentenced the improbable hero of Iraqi nationalists to three years in prison for hurling his shoes at former President George W. Bush. Sobbing relatives and his lawyers vowed to appeal the ruling, which appeared to tap patriotic fervor in Iraq six years after the U.S.-led invasion. Many lived vicariously through the oft-televised footage of Zaidi’s deed at a Dec. 14 news conference held by Maliki with Bush, in his last visit as president. People rallied to Zaidi after the verdict. Iraq’s journalist union called on Maliki to pardon the reporter. Two lawmakers with Shiite cleric Muqtada Sadr’s nationalist political movement attended the trial in a show of solidarity. Sort of along those lines, this Los Angeles Times article reports that some Iraqis are deciding not to try to go to the US, after all. The local news, meanwhile, reports on America’s economic woes, of foreclosed homes being auctioned off for a pittance. Word filters back from Iraqis in the U.S. who are unable to find work, struggling to afford medical care, and devouring savings that once seemed everlasting. “It used to be that going to America was a dream. No more,” said Raheem, 56, a former teacher and experienced reporter who is one of the local cast of journalists, interpreters, drivers, guards, technicians and general fix-it men and women who have kept The Times running here since the war began. Now the economic aspect invariably creeps into the conversation. One rumor making the rounds is that things in the United States are so bad, new refugees could be sent to Guam. “Life here has been difficult. We did not arrive at the perfect time,” one former Times staffer wrote last month from his new home on the icy East Coast. By the time most applicants had gone through the requisite Department of Homeland Security checks, interviews and medical exams, the U.S. stock market had begun to tank. Iraq’s government, meanwhile, had begun making life here more attractive by giving pay raises to civil servants, many of whom juggle their state jobs with work for American news and nongovernmental organizations. Even with unemployment in Iraq officially at 18% — far higher than in America — Iraqis are eligible for monthly food rations no matter what their income. In a society where bank loans and credit cards are virtually unheard of, most people own their homes outright. And many Iraqis are flush with cash after years of having little to spend money on. And Muntazar al-Zaidi is up to 47,162 fans on Facebook today. Today’s LA Times had more information on Iraqi icon Muntazar al-Zaidi’s case in court. His lawyers have good arguments. Zaidi’s legal team, more than 20 lawyers who jostled for space around the pen, cited two principal reasons why their client should not have been charged. Bush was a drop-in guest, they said, not an official visitor to Iraq, hence he should not face charges of assaulting a visiting dignitary. Second, they maintained that because the act occurred in the U.S.-controlled Green Zone, Bush was not technically visiting Iraq at the time. On a whirlwind trip shrouded in secrecy and marred by dissent, President George W. Bush on Sunday hailed progress in the wars that define his presidency and got a size-10 reminder of his unpopularity when a man hurled two shoes at him during a news conference in Iraq. It was the hottest ticket in town. It drew spectators from as far off as Sweden and sparked a scramble for choice seats. Police formed human chains to block crowds that surged forward to glimpse the star attraction: a defiant-looking man in black loafers. As the defendant entered the courtroom, applause erupted and most spectators stood up, either to get a better look or to express support. Zaidi glanced at the crowd but remained poker-faced. Pandemonium erupted when the session adjourned. Friends and relatives rushed to the pen, hoping to touch or kiss Zaidi. Courtroom guards yelled at the crowd to behave and leave the room. In the corridor outside, police linked arms and formed human chains to prevent hundreds of onlookers from closing in on Zaidi. He waved at the mostly cheering crowd and raised his fist in the air before disappearing down the staircase, surrounded by guards. I am staying tuned for future developments. 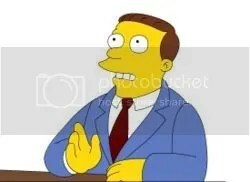 Hutz: I move for a bad court thingy. Judge Snyder [modeled on Robert Bork]: You mean a mistrial. Hutz: Right!! That’s why you’re the judge and I’m the law-talking guy. Judge: You mean the lawyer? 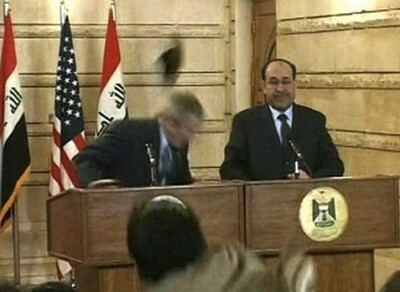 Everyone wants a pair of shoes like the ones thrown at President Bush in Iraq. Although his assertion has been impossible to verify — cobblers from Lebanon, China and Iraq have also staked claims to what is quickly becoming some of the most famous footwear in the world — orders for Mr. Baydan’s shoes, formerly known as Ducati Model 271 and since renamed “The Bush Shoe,” have poured in from around the world. A new run of 15,000 pairs, destined for Iraq, went into production on Thursday, he said. A British distributor has asked to become the Baydan Shoe Company’s European sales representative, with a first order of 95,000 pairs, and an American company has placed an order for 18,000 pairs. Four distributors are competing to represent the company in Iraq, where Baydan sold 19,000 pairs of this model for about $40 each last year. I need to find out what size my dad wears, in European sizes. Given their light weight, just under 11 ounces each, and clunky design, he said he was amazed by their aerodynamics. Both shoes rocketed squarely at Mr. Bush’s head and missed only because of deft ducks by the president. By the way, the original pair of shoes was destroyed while being tested for dangerous substances. So that Saudi who offered ten million dollars for the “freedom shoes” is out of luck. He has 2,655 fans as of right now. Update: today (Tues the 16th) Muntazir has over 6,200 fans.